Q: Should you drink during a workout, rinse your mouth or pour water on your head? A: You can do all of them. Replacing fluids lost during exercise is critical to performance, stamina and comfort. Losses as little as 3% body water can have a negative impact on stamina and performance. Spraying your mouth is comfortable but does very little for actual body needs. Since up to 40% of heat lost during exercise is via your head and scalp, proper ventilation and cold water on your head and neck can be both helpful as well as overall health protecting. Q: What is the best drink? 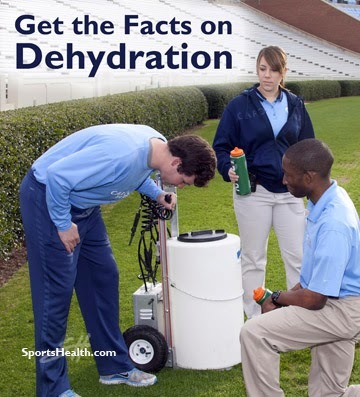 A: Cold water is good; sports drinks are very useful for those long days or double practice days. Avoid carbonated drinks before and during exercise. Avoid drinking excessive amounts of carbonated drinks which contain sodium and/or caffeine since they may produce dehydration. Q: How much should you drink each day? A: Young exercising teens should drink 10-12 glasses of water or sports drinks (before and during) as well as juices (after). You cannot count on your thirst though since it shuts off before the body is fully replenished. Q: How common is dehydration? A: Fortunately not very common. Dehydration develops over a couple of days. This gradual loss of sufficient fluids can produce muscle cramps, headache, dizziness and fatigue. It can occur in any sport, indoors or outdoors. You should return to 90-95% of your weight by the following day; if not you have not replaced sufficient amounts of fluids. Check the color of your urine. It should be the normal light yellow not dark. Q: What else can be done to help acclimatization? A: When given the chance to rest....rest. Seek cool, air conditioned areas in the summer heat after practice. Eat plenty of fruits. Low fat chocolate milk after practice has the added benefit of providing protein to repair sore muscles, fluids to help hydrate and carbohydrates to restore energy. Remember: Proper hydration begins at home! Come to practice well hydrated and go to bed well hydrated!